Host your next cocktail party with this one-of-a-kind handcrafted serveware set by JBC Woodcraft®. This handsome set is made from stainless steel hardware and features highly polished Canary Wood handles. 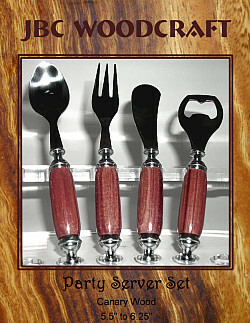 Includes 5.5" Bottle Opener, 6" Spreader Knife and 6.25" hor d'oeuvre Fork & Spoon.